Let’s start with one of the simplest case to cover: non-encrypted on-prem to on-prem communication. It is a scenario where we have more flexibility when it comes to understanding the set-up and infrastructure. In this first example we have a client wanting to consume an HTTP service provided by a local server. 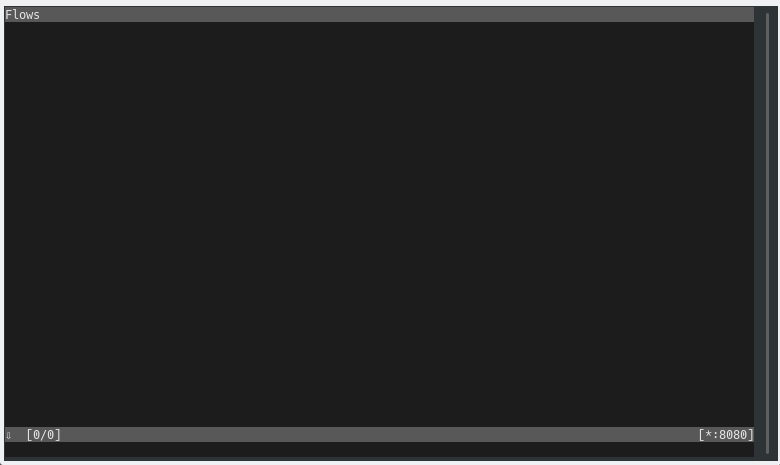 Thus, the simplest thing is to use mitmproxy in the standard “proxy” mode. (The same style of proxy that many companies use to allow their employees to access the Internet). In this first exercise, we will become familiar with the mitmproxy operation in its command line mode. Observation: The purpose of these posts is not to cover how to instantiate or create services, therefore I will only give limited data regarding this and will focus on the operation of the proxy. If you have any doubt, leave it in the comments and it can be used to enrich the Q&A section of the last post of this series. Please, ensure that you can open and use your local ports 8080 and 8085. Otherwise, change your ports accordingly. 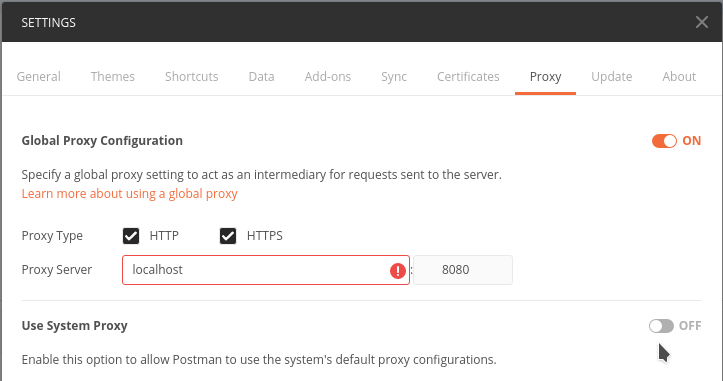 First, it is necessary to tell Postman that we will use a proxy for our connections. This is done in the settings under the tab “proxy”. As we are using a local hosted proxy, the proxy server address is “localhost”, however, if your request comes from a different on-prem server, you will need to change and use your IP or LAN hostname. We create a POST call with some headers, parameters and a body. The url will be pointing to our echo server on port 8085 (again, adjust your hostname/ip according to your landscape) Don’t forget to put the “http://” at the beginning of the url, otherwise Postman’s proxy configurations will be bypassed. Execute the call and wait the response. 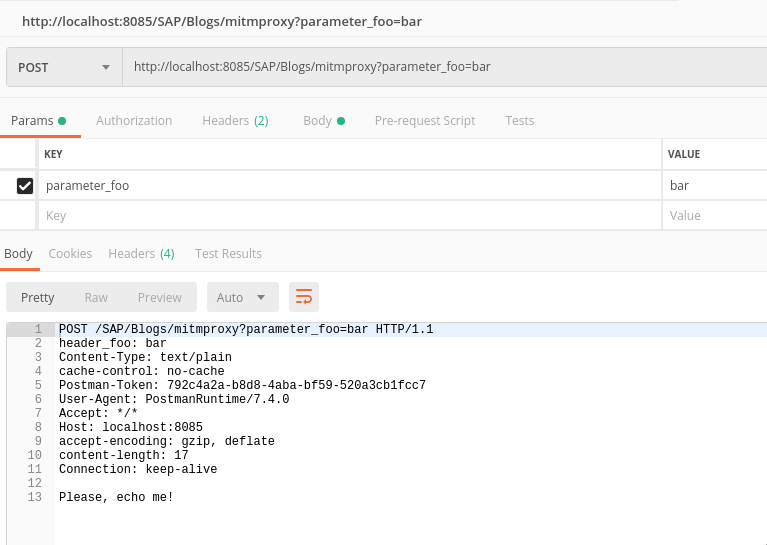 When executing, in the proxy UI, we can verify that a call has been registered and executed by the proxy. Also, important information is already provided, such as destination, url, method, parameters, HTTP response code and total time. The full content of the request, including those headers automatically added by postman. And the time details and connecting data. This view also lets you review possible redirects, certificates and name resolution when applicable.